Once a month here at StashMyComics we are going to try and have a column called Crossover Classic. Now what does that all entail exactly? We will be looking at crossovers that companies have rolled out over the years, both internal and between each other. Not only will we be revisiting them, but deciding whether or not they were successful. Successful in what sense of the word you may ask. For one, having a good, well written story and some fantastic art helps. But, the main focus is whether or not the crossover had a lasting impact on the landscape of it’s company. With that in mind, let’s jump right into Marvel’s Civil War. If you haven’t read Civil War or aren’t really sure what it’s all about, it must be one huge rock you have been living under. It was a massive event that all hinged on a piece of legislation that required heroes to register their identities with the US government. The Registration Act eventually caused Captain America’s anti-registration heroes to be pitted against Iron Man’s pro-registration side. 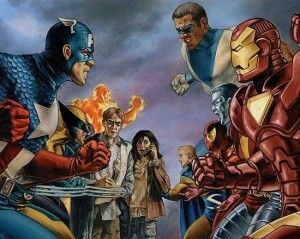 The two groups of superheroes were embattled (hence the “Civil War” title) and it ended when Captain America turned himself in. Now that the little bit of backstory is out of the way, let’s move into the real meat of why we’re here. Civil War had a number of aspects that had huge repercussions across the Marvel universe. Not the least of which was Spider-Man unmasking publicly, and registering his identity. This was one event that felt out of place to me. 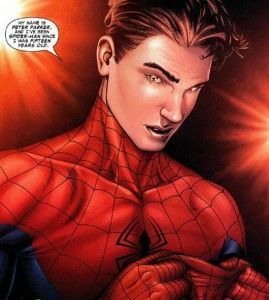 I understand that from a story perspective it moved the plot along, but Spider-Man’s identity was one of the most closely guarded secrets after Superman and Batman’s identities. Spidey “coming out” fell short for me because it seemed a little unbelievable. Now the fallout from that did lead to Aunt May getting shot and then Peter’s marriage to MJ being magically annulled in the horrible Brand New Day arc (but that’s a topic for another time). Even though the webslinger showcased his identity for the world, that has all been wiped out, again thanks to Brand New Day. 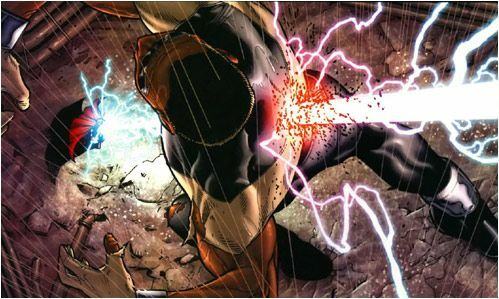 It was a huge event at the time, but since no one remembers it now, it’s one aspect of Civil War that hasn’t left a huge impression on the 616. Now, I’d be remiss to not point out that Spidey’s reveal led to his marriage being dissolved. But, that felt like everyone at Marvel went, “oh crap, everyone knows who Spider-Man is, how can we put things back to normal?” And because Joe Quesada hated Spider-Man being married because the character couldn’t survive as a married man (despite the fact it been like that for a couple of decades). Say what you will about the control freak Batman is, I doubt he would ever go as far to clone Superman and then put Wayne Industries technology in the clone. If cloning a god and turning him into an android sounds like an awesomely bad idea… it was. The android ended up killing Bill Foster AKA Goliath and had to be deactivated. Following the real Thor’s return, the clonedroid, as I’ll call it now, was decommissioned. But, after Secret Invasion, it went nutso since Skrull Henry Pym wasn’t around to put a code in to keep it deactivated. The clonedroid now goes by the name Ragnarok and was under Norman Osbourn’s control last seen being destroyed by Spider-Man and Iron Fist. Probably the biggest thing to come from Civil War was the death (supposedly) of Captain America. 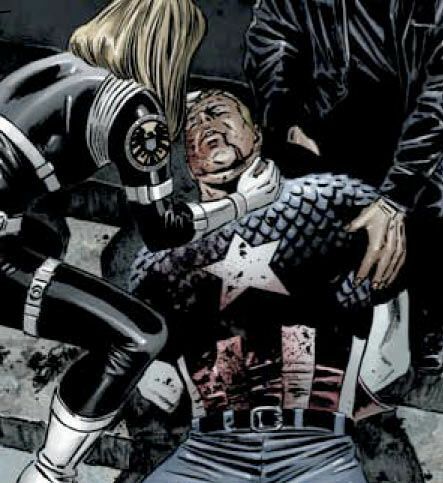 After Cap turned himself in, he was sniped by Crossbones and then a brainwashed Sharon Carter took him out from point blank range. But, if you follow Marvel at all, you know that Steve Rogers is no longer dead. Turns out he was never really dead just “frozen in time and space”…. whatever that means. But, due to his somewhat recent Reborn arc, Captain America came back (surprised?) and was installed as head of SHIELD. Even though his death has been reversed, the repercussions from it were still pretty big. Tony Stark took over as SHIELD commander, and using his post and a request from Rogers that Bucky be the new Captain America, he made it so. Oh, and since Steve Rogers was asked to be the head of SHIELD, one condition was that the Registration Act be overturned, so there’s that. I remember Civil War being incredibly enjoyable when I first read it, despite the couple of crazy acts from characters (I’m looking at you Peter Parker). But, we are looking at this from the goggles of “if it changed the landscape.” Well, Spidey’s identity is forgotten, Thor is back, Steve Rogers resumed the Captain America role, the Registration Act is repealed, and so on. I will make the argument that subsequent crossovers built upon the groundwork laid in Civil War so if you wanted to argue it had a huge effect on the 616, I wouldn’t fight it. I think a good way of looking at it, would be how much time elapsed between a change, and to when it was changed back. And in the case of Civil War, I think it succeeded. What do you think though? Was Civil War a successful crossover? Did you like it? Did you hate it? Did you even read it? Let me know in the comments. If you haven’t read it, and I just spoiled it for you, well, it’s been out half a decade, get a move on! Civil war had more of an impact for me on how characters interact with eachother. I think there’s more distrust and drama now between the heroes. There could have been larger ramifications felt on a 616 universal level, but like you said, a lot of these things have been put back. Great column. I look forward to more of these!